Before discussing the basic protections provided by the FDCPA, it is important to have a clear understanding of what debt collectors are. Debt Collectors are hired on commission to collect accounts. They may also purchase debts outright from creditors. Within 5 days of initial contact, a debt collector must provide in writing: (1) the amount of the debt; (2) the name of the creditor; (3) a notice that unless the consumer disputes the validity of the debt within 30 days, the debt will be considered valid; and (4) that the consumer can request verification. All collection activities must stop during the validation process. If the debt collector does not provide the original creditor’s identity, the collection must cease. After initial contact, the FDCPA continues to protect the debtor from overreaching, harassing, and illegal activities. Debts are private matters; not only is revelation to third parties a violation of the FDCPA, but communication that identifies the sender/caller as a debt collector or allows the contents to be read (e.g. postcards) is also a violation. Debts beyond their statute of limitations cannot be collected. 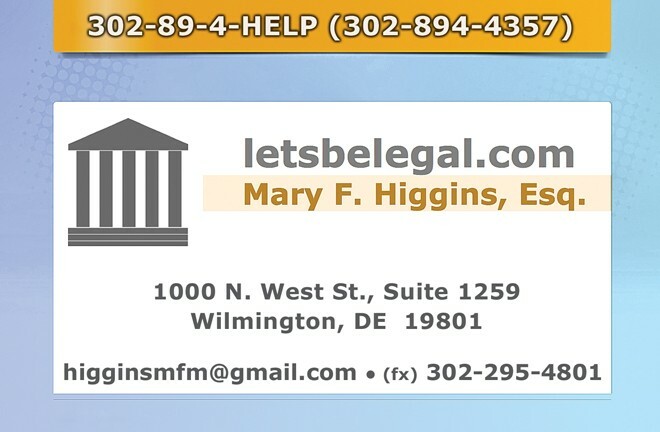 If you think a debt collector has violated the FDCPA, complete a FREE CASE EVALUATION at www.letsbelegal.com, or call Mary Higgins (302-894-4357). The FDCPA provides for damages if your rights have been violated, and the statute allows one year to bring a lawsuit. Mary became a Delaware attorney in 2002. Her practice was started to enforce Federal consumer laws due to concern that, unless one was in bankruptcy, few Delaware resources existed to battle illegal collection activities. Mary is Of Counsel to a national law firm that helps consumers fight foreclosures. She also conducts Fair Hearings for the Delaware Department of Health and Social Services, judging appeals from decisions on Medicaid and other social services. In law school, Mary was a member of Phi Delta Phi Harrington Inn Honor Society, and represented Widener University Law School for the Philadelphia Bar Association Judge Irvin Stander Memorial Prize in Administrative Law. Based on her record of public service, she was awarded a Public Service Fellowship by the University of Delaware (then) College of Urban Affairs and Public Policy, to obtain her Master’s Degree in Public Administration. She was chosen as a Graduate Woman of Excellence, and won a Legislative Fellowship to work with the Delaware State Senate Majority Caucus. Mary did a great job representing me. She kept me informed of what was happening with my case and let me know what I needed to do on a regular basis. When you have a legal issue in your life it can overwhelm you. Knowing someone was handling things legally allowed me to focus on the rest of my life, this was a true blessing. ~ Melissa T.